Hair Loss is a common complaint and is not gender specific, it affects males and females equally. In men it is related to the peripheral effects of Testosterone, and in females if it is hormone related, it is associated with an imbalance most of the time. 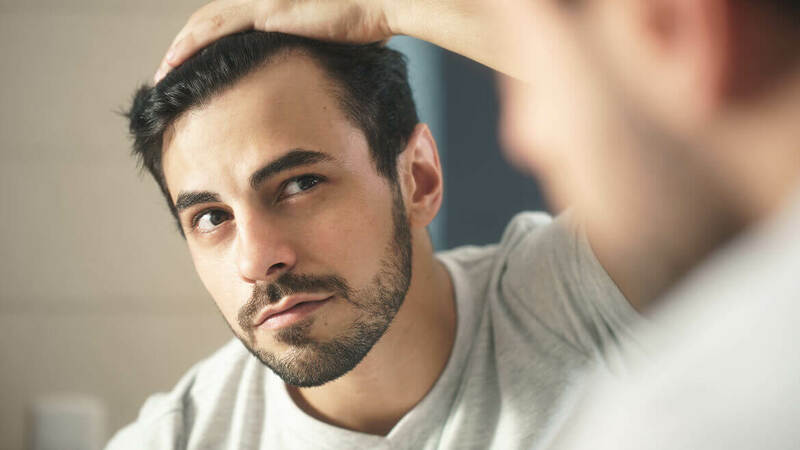 Treatment for Male Pattern Baldness is ongoing and almost lifelong whereas with females it is reversible to a large extent, even on stoppage of treatment. This is obvious because we cannot reduce the natural Male hormone hence the saying “bald men are more virile”. Alopecia is the general medical term for hair loss which is more than normal and is physiological most of the time wherein one notices baldness, thinning of hair or reduction in the volume of hair. Hereditary thinning or baldness (also called Androgenetic Alopecia). Telogen Effluvium is when there is sudden hair loss seen post illness, childbirth, hormonal imbalance and can also be caused by diet restriction and oral medications. Traumatic Hair Loss due to beauty practices like ironing, keratin and straightening treatments. Alopecia Areata is a medical disorder of hair characterised by bald patches on any part of the body. At times it can spread to affect the entire body hairy areas. This requires multiple treatment modalities and at times combinations of medical and cosmeceutical hair products. Treatment is obviously as complex as the causes. A detailed consultation can point us to the modalities of treatments we need to combine, and we use combinations of medical and cosmetic procedures as well. Platelet Rich Plasma is concentrated blood plasma which contains 3-5 times the number of platelets found in normal circulatory blood. It contains various growth factors and bioactive proteins that aid in hair growth in male and female patterned hair loss. After collecting the patient’s blood and processing it, the platelet rich liquid component is filled in syringes and re-introduced into the treatment site. A cocktail of stem cells, peptides, minerals essential for hair growth and vitamins are infused into deeper layers of the scalp resulting in hair growth and improvement of hair thickness and density. This therapy is specialised and tailored to treat the scalp, hair and causes of alopecia at times. This not only requires an in-depth knowledge of the hair and skin but also of the pharmacology behind the products used. Here we use lasers which stimulate hair growth, heal skin scars at times and also enhance hair quality. We use LED low laser therapies combined with certain solutions and use fractional lasers with special hair mode attachments, in addition to a truly medical thought process, which makes our therapies unique. There is no single modality of treatment for patients with various hair loss. Some may show results with minimal therapy and some require combinations which are constantly evolving and changing. This is what our team specialises in and we also maintain both pre and post hair transplant cases.